"Khursevich, G.K., Kociolek, J.P., Iwashita, T., Fedenya, S.A., Kuzmin, M.I., Kawai, T., Williams, D.F., Karabanov, E.B., Prokopenko, A.A. and Minoura, K. 2004 . 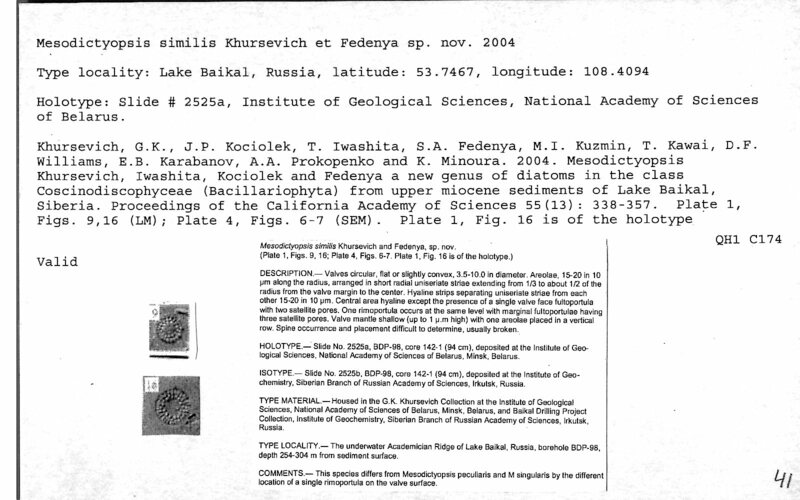 Mesodictyopsis Khursevich, Iwashita, Kociolek and Fedenya, a new genus of diatoms in the class Coscinodiscophyceae (Bacillariophyta) from upper Miocene sediments of Lake Baikal, Siberia. Proceedings of the California Academy of Sciences, series 4, 15:338-357." All cards in the DNTF catalog have been scanned and uploaded to this website! You may find that there are cards missing or incomplete. While we may uncover a few hidden around the Herbarium, there are many taxa for which we know cards were not made. We are working to fill in these gaps, but we welcome your constructive comments and suggestions in the meantime! If you notice broken links, illegibly scanned cards, incorrect citations, spelling errors, etc., please direct comments to ans_diatomherbarium@drexel.edu. You may also notice that we have made changes to site navigation. We hope these changes make it easier to browse and search records. With your feedback, we can continue to make improvements to this site. It has been more than 2 months from the 24th International Diatom Meeting (IDS 2016) held in Quebec City, Canada, where our team presented a talk “Diatom nomenclatural rules and best practices”. As we promised to make the information available to you, we finally do so. Now you can download pdfs of our presentation, separate handout for types and a handout with table of ICN rules limited by dates here, or you can go to our new tab “Taxonomic hints”. As you can see, we have just opened our website to the public and it is far from being completed. But we did not want to wait any longer to share it with you! Please, be patient with us as we keep scanning more cards, and as we are trying to fix lots of minor issues we are already aware of. We will keep you updated here, whenever significant changes and website improvements are made. We will also let you know here, when we are ready to get flooded with your constructive comments and suggestions. Genera starting with letters highlighted in grey (in the alphabet) = card scanning and uploading has been completed. Taxa accompanied by a card symbol ( ) include cards of species and infraspecific taxa. No symbol next to a taxon name = no cards are present in the NSF (mostly a taxon described prior to 1933). Each taxon published after the issue of Mill’s Index (1932) should be associated with a card on this website. However, we have been noticing a small percentage of missing cards during the databasing process, and are trying to keep notes on these. Also, many names published in recent years (since 2012) are completely missing in our database and website, therefore also no cards are present for these. We are aware of the fact that this is an incomplete project and will be working towards complementing it in the future. In fact, we will greatly appreciate contacting us when you notice any missing records, misspellings, or errors. Cards can be one- or two-sided, depending on the amount of information about the taxon in the original publication. Relatively new taxa usually have information on both sides of the card. Rarely, additional card or cards were made (3rd, 4th, etc. side of a card), if more information was included but did not fit on the first card. The size of all cards is a standardized 5 x 8 inches. Images from old publications (e.g., drawings) were photocopied or cut directly from the original publication and pasted on the card. Therefore, these images should retain their original size. 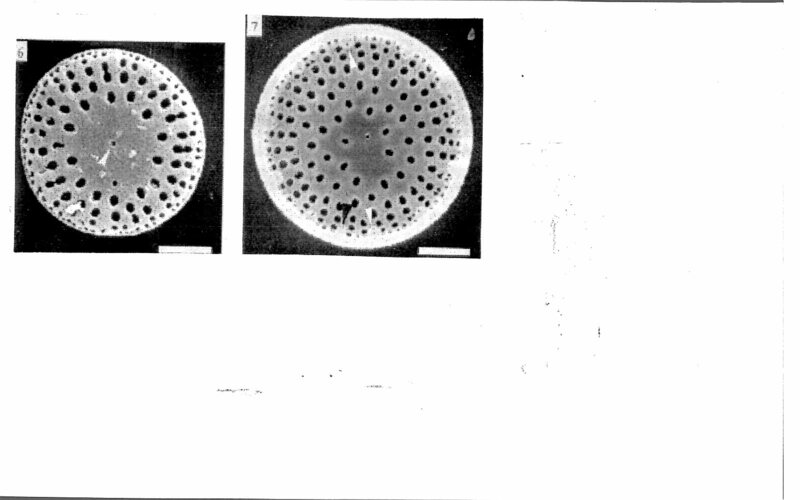 Photographs from relatively newer publications taken under light microscope (LM) have been sized to 1500x magnification on the cards, which is the standard used in most diatom taxonomic literature. Images taken from observations under the electron microscopes (SEM or TEM) are usually adjusted to fit on the card (made smaller), as each picture is usually taken in a different magnification and scale bars are present for each image. Indication of a novelty: new genus, species, combination, status, name, etc. ; sometimes a new type (e.g., holotype, isotype, lectotype, isolectotype, neotype, epitype), emended description or validation is specified. “Problematic name” (physically an orange card) indicates a taxon or entry with issues (e.g., taxon cited in a publication, but the name could not be confirmed or was determined as an error or misspelling). Reference: In full or abbreviated form. Images: Drawings (in original size), LM photos (in original size or 1500x magnification), SEM/TEM photos (usually made smaller to fit the card). Note that not ALL images from the publication have to be always included on the card (in that case, representative images are chosen). Written comments (e.g., validity notes) mostly by Charles W. Reimer (see Acknowledgements).